Ayshford is a Grade I listed fifteenth century former private chapel. It is a small free-standing Perpendicular building with diagonal buttresses and a rebuilt bell-cote. The chapel was the subject of a major conservation campaign by the Friends in 2001/02. The interior was restored to a wonderful salmon-pink limewash and the striking Art Deco type glass of 1848 was also repaired. 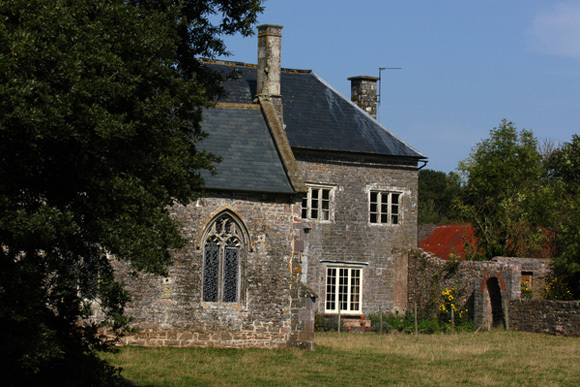 The interior boasts a medieval cusped screen with traces of red, green and blue paint and floor, chest and wall monuments to the Ayshford family including Henry Ayshford (died 1666 aged one year). The wagon roof is particularly noted for its carved fifteenth century bosses. Keyholder nearby. Call office for details. Visitors should remember not to shut inquisitive sheep in the church when they leave!